Glowing fuel for two-stroke engines for top competitive aerobatics and extreme 3D flying suitable for racing helicopters and planes. It delivers lightning-fast response, high performance and reliable operation even in extreme 3D turns. Suitable for two-stroke and four-stroke aircraft engines for F3A and 3D models requiring high nitrate content: YS, OS MAX etc. It contains 20% of fully synthetic KLOTZ oil with super low viscosity and 30% nitromethane. 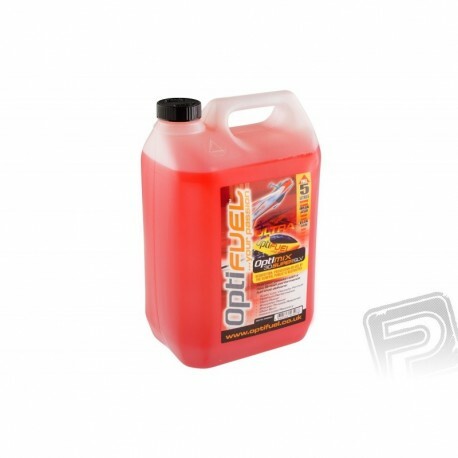 It contains the red dye KLOTZ Red for easy visual inspection of fuel tank status and distance - this is especially useful for RC helicopters and cars. The dye does not affect the operation or adjustment of the engine. Pack of 5 liters.